Would you like to start living in Spain in order to work in the country? Then this guide is for you. Why? Because we are going to cover everything you need to know regarding the Spanish work permit. Types of working visas, legal application procedure, requirements and conditions you must follow… After reading this post, you won’t have any doubt left! Let’s learn how to live and work in Spain legally. What are we going to cover on this guide? Getting the work permit as a tourist in Spain. Is it possible? 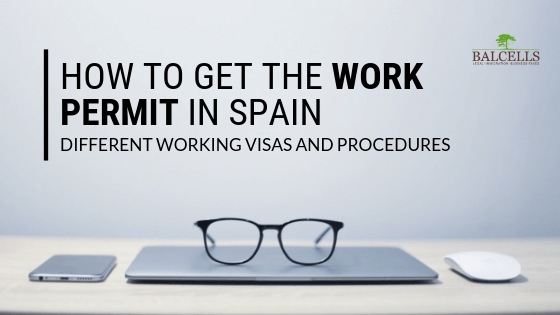 THE FIRST QUESTION: DO YOU REALLY NEED A WORK PERMIT TO WORK IN SPAIN? That is the first thing you should ask. Because there is a situation in which you don’t need to actually get a work permit. And that will save you a lot of time. That is the case of citizens from a European Union country, from Switzerland, or from a country member of the European Economic Area (EEA). Then, you don’t need to apply for a working visa: you implicitly possess one through the Schengen agreements. In that case, you will just need your identification number (NIE), and to prove that you have sufficient funds and health insurance that offers full coverage in Spain. On the other hand, if you are a non-EU citizen (or not from Switzerland nor from the EEA), you must go throughout the whole procedure. But don’t worry. We are going to explain to you how. SECOND QUESTION: ARE YOU ALREADY IN SPAIN? From now on we will focus on what should non-European citizens do in order to start working in Spain legally. Before going with more details with the types of work permits and the exact procedure for each of them, we must make a clear distinction. And that comes by answering the question: are you already in Spain? That will be something crucial here. As we will see in upcoming sections, one of the main requirements to apply for a work permit is to start the procedure from outside the country. This means that you cannot be in Spain to manage all the relevant paperwork once you find a suitable job offer. But there is an exception. If you have been living in Spain for more than 3 years under an irregular situation, you can get your work permit through the process called arraigo. This is an extraordinary procedure that will allow you to get a residence permit provided that you fulfill certain conditions, which are completely different than those we will tackle in this article. Let’s say, then, that you would like to move to Spain in order to work, but you are still in your country of origin. Then, you will have two options in order to get your work permit: doing it as an employee or as a freelance/self-employed individual. Each of them has different requirements and application processes. This type of work permit is for those individuals who have already found a suitable job offer in Spain. In Spanish, the work permit to work as an employee is called “por cuenta ajena”. You may have seen it written like that in other platforms. This means that the first step in the process is to find a job offer from an employer in Spain. There must be a company willingly to hire you and to start the application procedure. Without that clear intention, you cannot apply for the Spanish work permit. We are talking about a one-year residence authorization that can be renewed if the required conditions are still met during the following year. That is something many of our clients ask us. Can I go to Spain in order to find a job offer without having a residence permit, and applying for it after I found a company that wants to hire me? The answer is simple: no. The Immigration Office is really strict with this issue, and it clearly states that in order to apply for a work permit in the country you must be in your country of origin. Being in an illegal situation Spain won’t enable you to go through a successful application. This means that, if you receive a job offer while you are in Spain, you should not accept it. No matter how hard the employer insists on hiring you. The foreigner worker, in order to get his or her permit to work in the country, must be under a legal situation in his or her origin country. Let’s say that you are in your country of origin, but you have found a job offer in Spain (or someone did it for you). The company really considers that you are the perfect candidate, and they are willing to hire you. Can you proceed? Well, there is something else you must take into account. Because maybe you do not have a preference status for that certain job position, therefore you cannot be employed. What do we mean by preference? After the 2008 crisis, the working categories and positions that can be offered to foreigners decreased. In an attempt to reduce the national unemployment rate, the Spanish Government makes it compulsory for companies to hire first Spanish nationals or EU citizens rather than foreigners for certain positions. Therefore, you must make sure that the working category you are being offered is on the Shortage Occupation list. That list is published by INEM (the Public Service of State Employment). It contains all the job positions you will have no problem in accessing once you have found a suitable job offer. Which are those? Mainly those with more difficult coverage options, as there is a lack of specialized personnel for that sector, for example. Before the crisis, inside that list, you could fin nurses, doctors, masons… But nowadays the list is much shorter. Therefore you must carefully analyze it and only accept job offers inside it. But not everything is bad news. Because there are two conditions in which you will enjoy what is called a PREFERENTIAL REGIME. It means that you can skip the shortage occupation list and start working in positions outside from it. Which are those cases? When the specific job position has been offered to Spanish nationals or EU citizens first and none of them has accepted. When you are the children of legal residents in Spain or the spouse of legal residents in the country. If the family reunification process has conditions and requirements you cannot meet, this could be your best alternative. Under those two conditions, you do not need to cover any specific job position and any offer will be valid for your application. The Royal Decree 557/2011 regulates the temporary residence authorization to work in Spain as a self-employed individual (also called “por cuenta propia”). It is for those individuals who would like to develop their economic activity on their own, without being employed by any company. We are talking about a one year permit that will allow you to work in the Spanish territory as a freelancer (autónomo), enjoying the new self-employed regulation in Spain. If you still meet the requirements, at the end of that year you can renew your residence authorization. After 5 years of consecutive renewals, you can apply for the long-run residence. There is one condition that is common with the work permit as an employee. And that is that you cannot be in Spain for the application. The procedure must be carried out from your country of origin or there where you have your consular demarcation (where you have your legal residence). One of the most important requirements is that you should have the training and professional qualifications necessary to undertake your job position. For example, if you are are going to be a doctor and open a private consultation, you must have a medical degree. You can also present training courses or workshops that support your activity. The underlying reasoning here is that you are able to prove that you possess the required abilities to develop your job position successfully. You must accredit that you will receive a sufficient economic investment on the business from abroad, or that you have the support commitment of any financial institution. Each project is different and has its own requirements, but in order to get your application accepted, you must prove that you have enough tools to grant the financing of the project. For that, you can provide loans from the public administration or from Spanish banks. You can provide any document you wish, but the financing you will receive must be enough to sustain what you present on your business plan. Just to give you a rough idea, in order to develop your own project and work as a self-employed, you must have an initial investment that covers the first year of professional activity, at least. Something highly valued on your business plan is the amount of potential employment your project is going to create in the country. Clearly defining how you are going to impact the Spanish economy is necessary. What does this mean? Simply, that once you have written and developed your business plan, detailing the activity you will develop, financing, etc; you will need to prepare and send it via email to any of this 5 institutions. They will review it and send a viability certification if they foresee that the project is likely to develop a positive outcome. You will need to send that certificate (all together with the rest of required documents) to the consulate. Then, you will be able to access the residence authorization to work in Spain as a self-employed. First of all, you must bear in mind that is your employer the one who will initiate the application procedure, not you. Where? At the Provincial Delegation of the Ministry of Labor and Immigration. There, after presenting the initial request, they will give him or her a copy of the document with the seal of that institution. The employer must send it to you, and you must bring that document to the consulate located on your country of origin. Then, after presenting the initial application document (sealed), the business plan and the other required documents, the consulate will have 3 months to emit a valid response regarding your application. The internal process they follow is like this: the consulate gets your documents, they send it to Spain, the Immigration Office instructs it and sends the concession resolution to the consulate. If the resolution is favorable, the consulate will put the working visa on your passport. Take into consideration that the whole procedure is really slow, lasting up to 8 months in total. So remember: you must always request your Spanish working visa from your country of origin! CAN YOU ALSO APPLY FOR YOUR RELATIVES WORK PERMIT? As you may know, many residence permits in Spain have the option of doing a joint application. That is, the applicant can also solicit the residence to legally work and live in Spain for his or her direct relatives. Is this the case with the work permit? No. This type of visa just gives rights to the main applicant, not to his or her relatives. But there is an alternative. There is a way for you to bring your family to Spain with you easily. How? Trough the process called family reunification. Once you have lived in Spain for more than a year with your work permit authorization and have renewed it for a second one, you can bring your non-EU relatives. After finalizing the procedure, they will be able to work without the need to apply for a work permit. We have stated before how, in order to successfully apply for your Spanish working permit, it was a required condition that you stayed in your country of origin. But, is there any exemption? Can’t I apply for the working visa if I am a tourist in Spain and get a job offer? Well, although the Spanish Immigration Law is really severe and does not allow you to, there are a few cases in which you actually can. Nevertheless, those cases are really specific. We had many clients, especially from South-America, that came to Spain for less than 90 days and found a job offer. As much interest the employer has on you, you usually can’t start the process. If the foreigner worker is in an irregular situation before or during the procedure, the case file will be denied or even not proceeded. And even if it was not (now not taking into consideration the general requirements), the timing will also be detrimental. As we have said, we are talking about a long procedure, and a stay status (under 90 days) will never be enough to go over all the required steps in time. Hiring through the Entrepreneur Law. The cases contemplated under this category enjoy preferential processing, which means that they are fast to be taken care of (faster than any other residence permit application). This is the case of the residence permit as a highly qualified worker or the intra-corporate transfer visa. Exceptional circumstances, under arraigo familiar, when you are a descendant of an original Spanish citizen or father of a Spanish under-aged child. Those situations in which you have lost your long duration residence, and, arriving in Spain under the tourist status, you solicit the recovery of ownership of the residence. Students also have it easier to work in Spain. If you are studying with a student visa, you can work a total amount of 20 weekly hours, provided that they do not interfere with your studies. Why 20? Because you are only allowed to do, in total, 40 hours including work and your studies. As there is a requirement for doing a minimum of 20 studying hours per week, you end up with just 20 hours to work. In this case, your employer will also initiate the procedure on your behalf. But, apart from that, can you get a regular job in Spain after having your degree or master? The answer is yes. If you have studied for more than 3 years in Spain, you can switch from a student visa to work permit. For that, you must have a job offer that lasts more than 1 year and consists of a minimum of 30 weekly hours. But you have another option. What if you would like to develop an activity on your own? Well, good news. You can also switch from student visa to work visa as a self-employed individual, provided that you present your project and business plan. The new immigration law for students emitted at the beginning of 2019 will benefit you in that sense. Because students who look for a job in Spain (or would like to start their own company) can now extend their student visa one full year in order to find it or regulate their situation. The requirement is that you must have finished your studies, being a degree, masters or Ph.D.; and must present the corresponding title. Bear in mind that the application period of this permit is not carried right after you finish the studies, but during the 60 days before the end or expiration of the student card; or 90 days later. The expiration of your student card does not necessarily have to expire at the exact same date of the completion of your studies. It can be months afterwards. Now you know exactly how to get your work permit in Spain. Nevertheless, navigating throughout the whole procedure can be a bit tough. But we don’t want you to worry about anything. We want to make your life easy and simple. Our mission is enabling you to enjoy your new life in Spain from the moment 0. And that means that we don’t want you to be in charge of the boring part. We want to do it for you. We have helped more than 1000 clients worldwide get their Spanish permit, and now we would like to help you. Would you like to get your working visa as fast as possible? Then do not hesitate to contact us, our immigration lawyers are waiting to start the procedure for you! Hay un confusión general respecto al número de horas que puede trabajar un estudiante. La ley establece que puede trabajar jornada PARCIAL. El código laboral establece que la jornada PARCIAL es INFERIOR a la jornada completa. Es claro que jornada parcial, NO ES MEDIA JORNADA, NI SE LIMITA A 20 HORAS. Tal y como indica la Ley de Inmigración, el ciudadano que posee el visado de estudiante puede hacer por semana, en total, 40 horas entre estudios y trabajo. Ya que es un requisito estudiar mínimo 20 horas semanales, únicamente quedan 20 para trabajar, tal y como hemos indicado en este post. I’d love to know about the non-lucrative Visa. All my work is U.S., online and am not looking for work in Spain. I’m only interested in living there. Or you can directly talk to one of our lawyers in person by sending us an email at info@balcellsgroup.com, whatever you prefer! Thank you very much for reaching out to us, hope you have a nice day!